Enter FAU's main entrance on West University Drive. Follow signs to the Library/Ritter Gallery. Turn right at Volusia Avenue noticing 4 story parking structure on left. Continue straight until road turns to right. Turn into one of the first drives to left to enter parking lot 19 in front of Library. The Ritter Art Gallery is to the right of the Library on the 2nd floor. Metered parking in Lot 19 is available. Or you may purchase a temporary permit online or at the information booth during hours of operation. Please visit Parking and Transportation website for more information. After parking walk to area adjacent to entrance to Library. Look up to the east and notice a Ritter Art Gallery sign. You cannot enter the building where the sign is. You must walk under the breezeway past the Einstein's Cafe headed east until you intersect a longer breezeway. 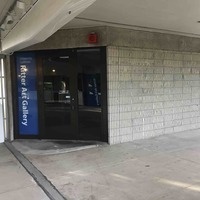 At the longer breezeway look and turn right to see signs and a stairway headed up stairs to the Ritter Art Gallery entrance.The facility is named for Mr. and Mrs. Roland Ritter who funded a significant part of the construction cost of the gallery.